Engine 39-22 - 1948 Autocar/US Fire Apparatus 1000 gpm/275 gal. This rig truly fits the motto of “Every Fire Truck Has A Story”. Featuring a semi-cab with a roll-up canvas top & small doors at knee level, this rig was re-powered in the 1960’s with a diesel engine after the original 275 HP Hall-Scott gasoline engine failed. In January of 1971, this rig was the second responding unit to a gas main explosion on Front Street which resulted in the LODD of Fireman Joseph Powers - due to a power failure, the electric overhead door was disabled slowing the response of this unit which was credited with saving additional lives. Following the Front Street incident, due to damage caused by the explosion, cab doors were added and the original windshield was replaced with a two pane windshield that was entirely chrome plated. 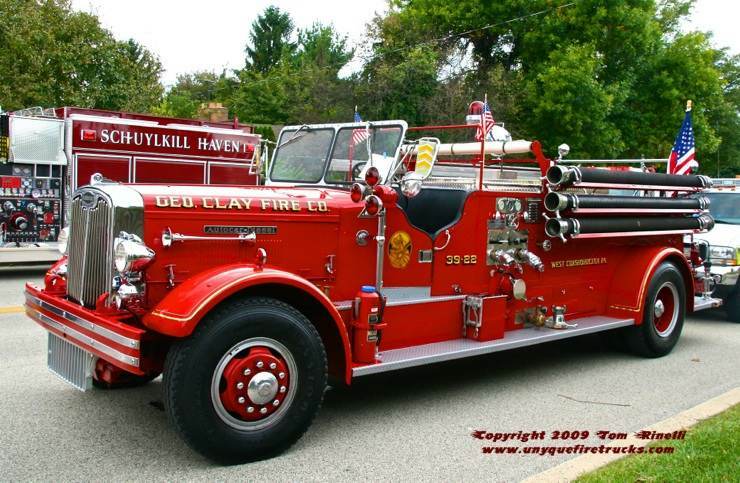 Sold to a career firefighter/apparatus collector from Maryland in 1982, the rig was disqualified from judging at musters as a antique due to the diesel engine - it appeared in the company’s centennial parade in 1998 and was returned to the company in 2007 from the collector. 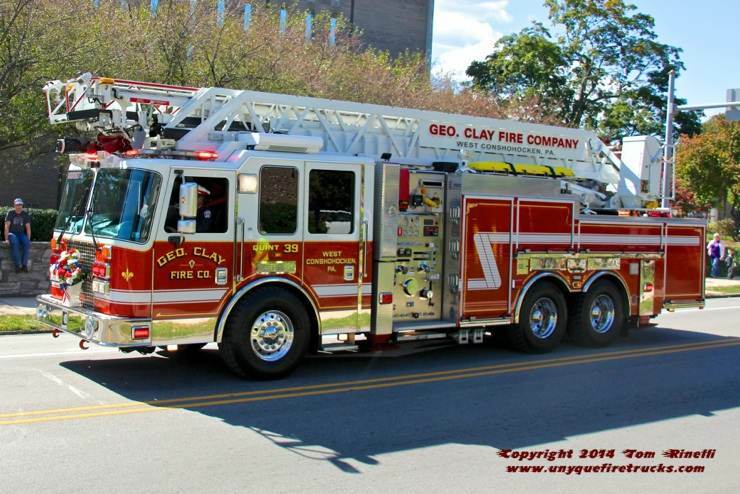 Quint 39-11 - 1993 Simon-Duplex/LTI 75’/1500 gpm/500 gal. Featuring a 10 man cab, this rig featured a 7.5 kw diesel generator, booster reel, On-Spot chains, four 500W telescoping floodlights and 119’ of ground ladders. Replaced in 2010 with a KME Predator 100’ tandem axle quint, this rig went on to serve the Washington Hook & Ladder Co. of Mahanoy City (PA) until it was destroyed in 2014 by a fire started in its’ engine compartment. Special thanks to fellow fire apparatus photographer & historian Bruce W. Anderson for his assistance in providing specs & the history of Engine 39-22. Organized in 1898, the company was offered a hose carriage by John H. Clay of Philadelphia with the stipulation that the town erect a suitable building for it & that the company be named after his brother thus forming the George Clay Steam Fire Engine & Hose Co. (John H. Clay went on to serve as chief engineer in 1899 & later as the first chief in 1904). Serving the Borough of West Conshohocken, the company’s volunteers provide Fire & Rescue protection. A prime example of innovative staffing in the volunteer fire service, George Clay has operated with a paid driver since 1922 (member Terrance “Pick” Campbell, the third driver to be hired in 1924 served in that position for FIFTY years as well as in the capacity as the chief engineer for 57 years!!). Present day, George Clay staffs a paid driver daily from 8 AM - 4:30 PM seven days a week. Quint 39 - 2010 KME 100’/2000 gpm/600 gal. The company’s current aerial device, it features a 20kw PTO generator and a pre-piped waterway. 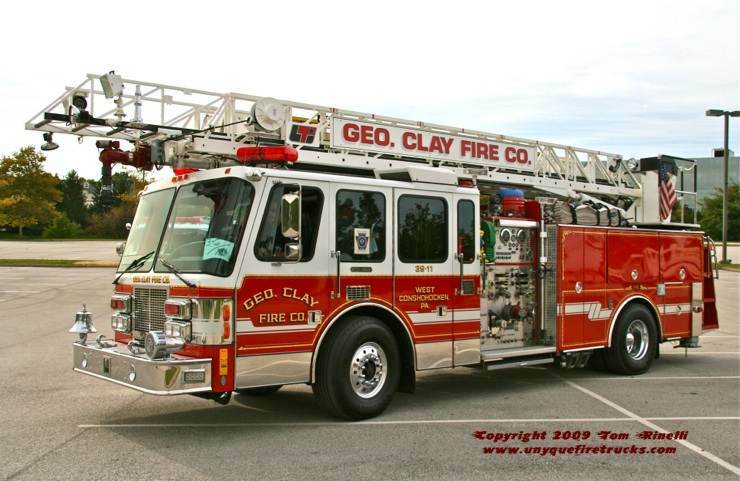 It is equipped with four 200’ pre-connects (two each of 1-3/4” & 2-1/2”), six SCBA with eight spare cylinders and a full complement of ground ladders.